Everything that's missing on the Magic Rarities, Magic card Sets and Magazine and Comics Galleries Sections. French Boil 8Th Edition: In the flavor text the word "Seront" is printed twice. French Disenchant 5th Edition: Some list Brian Snoddy as Brian Sn%oddy. Regarding French Revised Edition White Border, some cards are missing Totally the Black line on Top of the Name.It seems that Normal Version and Misprint Version exist for some of the cards.What makes it difficult is that apparently some cards seem to exist Only in the Misprint Version like Ange gardien while others in both versions,not mentioning that some of them are missing partially the black line.So far,I have only spotted 2 Commons White cards Guardian Angel and COP Blue,but,I believe more may exist.If any Members have any of these cards thanks to post about them,so a list can be create. 3 T : Rod of Ruin deals 3 damage to target creature or player. 3 T : Rod of Ruin deals 1 damage to target creature or player. 1 T : Tap or untap target artifact, creature, or land. 1 T : Tap target artifact, creature, or land. When you have 20 or more life, you Win the game. When you have 20 or more life, you lose the game. Italian Commander 2013 reprints from P3K set have Italian text but English card names. Same thing for Night Soil and Endless Cockroaches. Last edited by dragsamou on Fri Nov 08, 2013 5:45 pm, edited 1 time in total. dragsamou wrote: Italian Commander 2013 reprints from P3K set have Italian text but English card names. Same thing for Night Soil. I couldn't find this on Squt's page. Missing the shadow ink in the P/T. 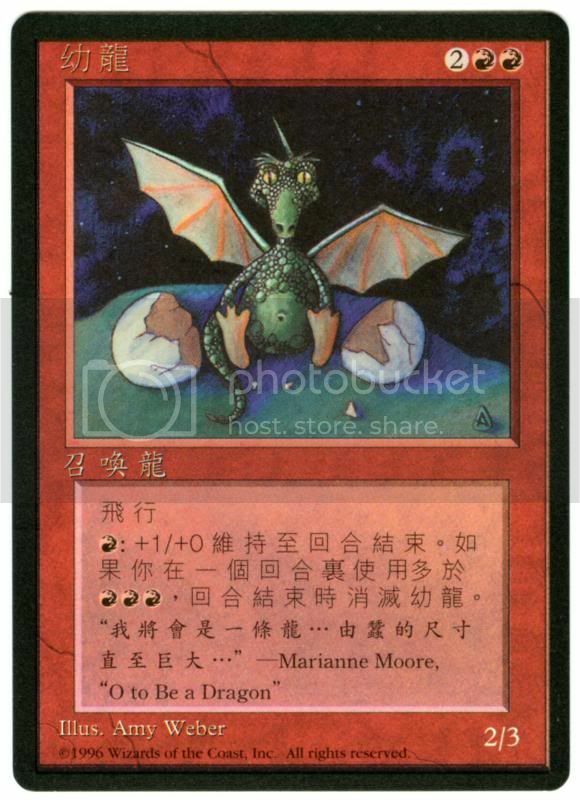 Squt mentions the Portuguese 4th BB Mana Battery cycle and Spanish Green Mana Battery (Artist error: All list Anson Maddocks, who did only Black). This is also valid for the other Spanish BB and for Portuguese WB, too. Spanish WB Green Mana Battery has the first letter in the rulestext missing: "on un contador" ("ut a counter"). For your list you may want to check the name on the 5th Ed. Korean Kjeldoran Dead. The list I found of card names listed it as 켈도르의 사자 or Kjeldoran Lion. I do not have the card and would be interested if someone that does have it could look at the name and confirm or correct that spelling. 5th ed Koran had more than it's fair share of misprints and I would like to know if the card is wrong or the name list is wrong. Father of a former Wizards of the Coast janitor. Knowledge is proud because it thinks it knows so much; wisdom is humble because it realizes it knows so little. mystical_tutor wrote: For your list you may want to check the name on the 5th Ed. Korean Kjeldoran Dead. The list I found of card names listed it as 켈도르의 사자 or Kjeldoran Lion. I do not have the card and would be interested if someone that does have it could look at the name and confirm or correct that spelling. 5th ed Koran had more than it's fair share of misprints and I would like to know if the card is wrong or the name list is wrong. As I recall Clay and I were both working off lists though and not the actual card so if you come up with a picture of the card please give me a link so I can put a scan in my library. Before when I was in Korea I didn't have any luck finding the card and forgot to look this last trip. Hay, thanks much. I will put that in my files. I'll be going back to Korea in April and will continue to look for one. Clay is in Korea now and I may be able to bother him to look for one. 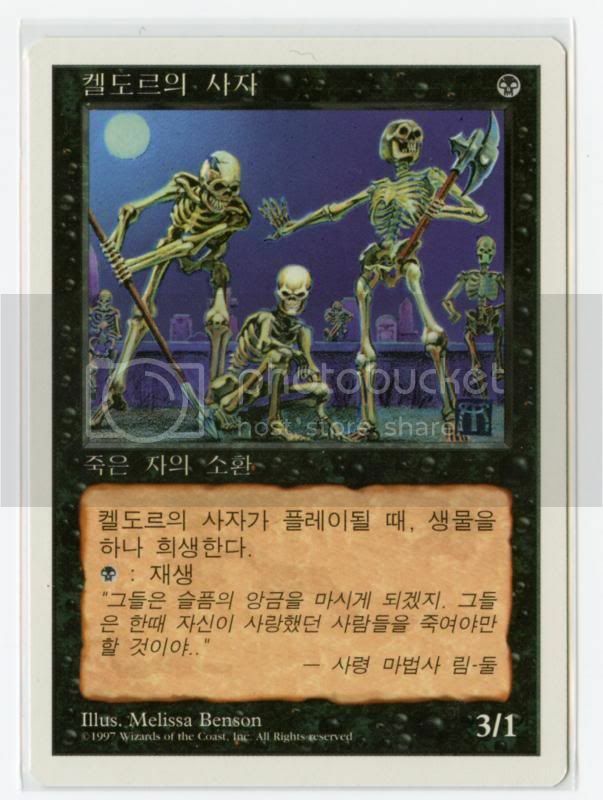 There has to be some around, Korean Magic players never throw anything away. First three have the "C" in the coypyright symbol in a different font. Next two are lacking the period after the copyright text. Last has a lower case "c" in brackets instead of an encircled upper case one. Others: The Dark Dance of Many has a chip in the blue frame upper left. When it comes to things like copyright lines and such we may want to consider them a variant printing verses a "misprint". If all of a set are done the same way it is a variant and not a misprint. We want to reserve misprint for a mistake in printing, not a change in printing. I am not familiar with any of the above and am just speaking to principle. It really is up to us as a group to define what "misprint" and "variants" are. There is no other group that is dedicated to collecting like we are. True there are very knowledgeable people that don't frequent this board but because this is the "Librarities" we need to specify the definitions. Let others dispute them if they will. I have long thought we should make a lexicon of terms to be used in defining such things.